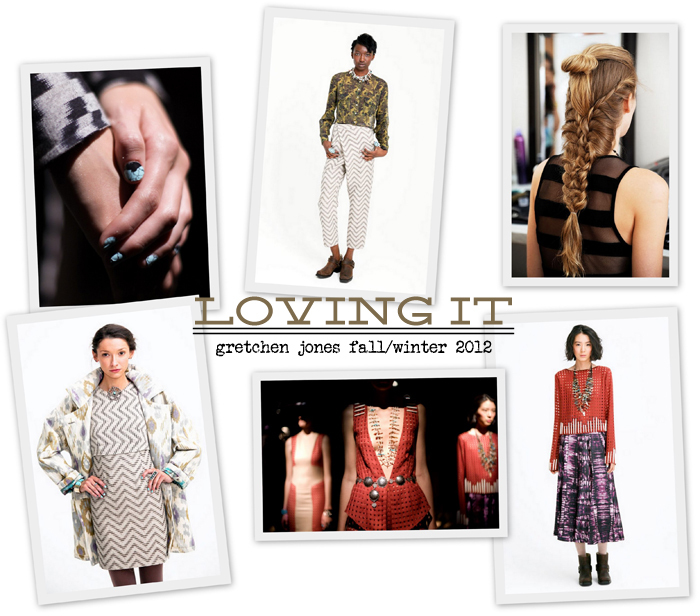 Courtesy of the Bumble and bumble's Allen Wood and Gretchen Jones, this peek backstage at Gretchen Jones' New York Fashion Week FW2012 presentation doesn't disappoint! How amazing is that ropey, textured hair? I want to rock this at the beach in Hawaii, walking down the streets of South Congress, and traversing the sheer cliffs of mountains (what?). Basically, this creative and cool style has totally stolen my heart. Maybe the whole backcombing and flat-ironing is a little intense for an average gal like moi (and tumbleweed isn't a good look for me), but the beautiful ropey twisty chignon...count me in. I really do need to get myself a bottle of that Surf Spray...it's the magic ingredient to pretty much every hair style that makes my heart go pitter-patter. To say I am smitten with this super-talented lady's designs is an understatement. Everything Gretchen does (and Bumble, for that matter, too) is totally brillz.